This fall, kids are in for a delightfully spooky treat on PBS KIDS. On October 28, PBS KIDS will premiere THE CAT IN THE HAT KNOWS A LOT ABOUT HALLOWEEN! on television and streaming devices. The new movie follows Nick and Sally as the Cat in the Hat takes them on an exciting Halloween ride. 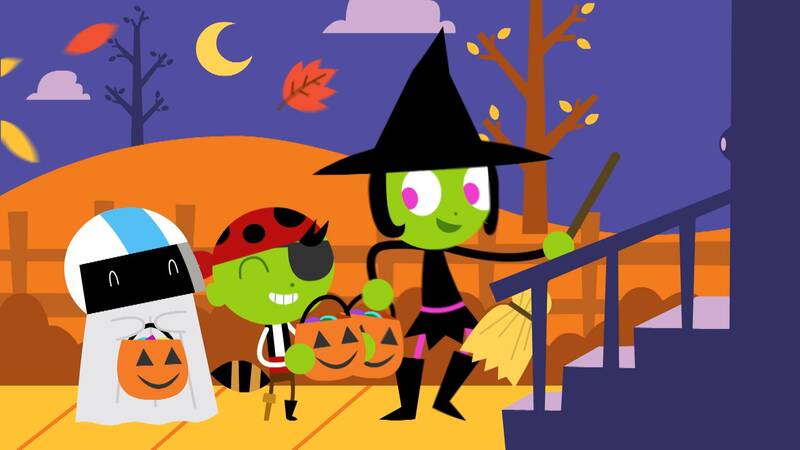 Additionally, PBS KIDS will premiere new Halloween-themed episodes from DINOSAUR TRAIN, NATURE CAT, and READY JET GO! Encore programming from PEG + CAT, DANIEL TIGER’S NEIGHBORHOOD and many others will also air and stream on PBS KIDS all month long. The treats keep coming in October when PBS KIDS will offer a variety of Halloween-themed games for kids to play on the free PBS KIDS Games App and pbskids.org, including the Cat in the Hat Corn Maze Craze, Cat in the Hat Camp Time, NATURE CAT Park Builder and PEG + CAT Parade. A new Spooky Street and set of rewards will be launching on PBS KIDS’ popular virtual world Kart Kingdom as well. Hands-on activities, including pumpkin-carving templates with favorite PBS KIDS characters, are available on PBS Parents. This fall, PBS will also offer PreK-12 teachers an easy way to integrate Halloween themes into their instruction with a range of curriculum-aligned videos, lesson plans and games. Teachers can use these resources to enhance homework assignments or kick-start classroom discussions. These free resources are available to teachers nationwide on pbslearningmedia.org. Examples include PEG + CAT’s Tiger Trick or Treat, PBS LearningMedia’s All About the Holidays: Halloween, PBS Digital Studios’ Frankenstein, M.D. and more. More information on PBS KIDS’ Halloween programming, including when to watch, is included below. A variety of Halloween DVDs are also available from PBS Distribution. The Cat in the Hat takes Nick and Sally on a wild Halloween ride in this all-new movie. Their fright-filled adventure takes them deep into the Oooky-ma-kooky Closet, where Nick and Sally discover the very best Halloween costumes ever. “Spooky Tree/Spinosaurus Super Model” – In “Spooky Tree,” as the Pteranodon family explores a mysterious tree that seems to come alive at night, they learn about bioluminescence along the way. Then, in “Spinosaurus Super Model,” Don tries to convince Old Spinosaurus to pose for a sculpture, highlighting the many features of the world's largest land carnivore. “Runaway Pumpkin/Lady Bug Tough” – The backyard gang has a Halloween party featuring the biggest, most beautiful pumpkin ever. “Jet’s First Halloween” (Parts 1 & 2) – In this special half-hour episode, Sydney, Sean and Mindy help Jet experience his first Halloween – from carving Jack-o-lanterns and dressing up in costumes, to trick-or-treating and going to a haunted house. Along the way, the gang learns about lunar eclipses and the Red Moon. An encore presentation of the popular Halloween-themed movie airs on October 24, October 28, and October 31.